Just the start of this album alone, the shouting of ” Cha” on a galloping drum makes my day. The positive vibe generated here is impossible to resist. 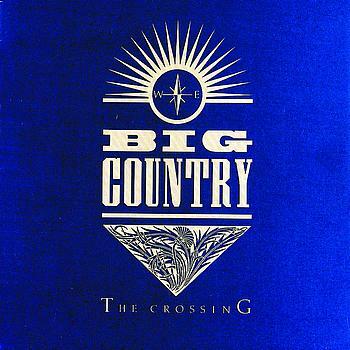 At the time Big Country created a new sound with the extended use of E-bow on their guitars. A little like an electronic version of the bagpipes the Scott’s are normally associated with ;-). Over the years I have found the sound of Big Country instant recognisable. The big moment on this record is obviously third track Chance. A heart warming song (where did the feeling go) and a deservedly big hit. The downside is, after that I hardly remember another song that gained that much attention. Which is a total shame, as I think they deserved far more than they got. But back to the music. As I stated at the start, album opener In A Big Country is a very uplifting song with an irresistible beat. Inwards also has that melancholic charm singer and guitar player Stuart Adamson was famous for. 1000 Stars has a lot of those guitar melodies gracing the vocals lines and is again executed with high energy. Next track The Storm opens slowly with a haunting melody and than evolves into a quick folky track. Harvest Home is again proof of the nice story telling over infectious grooves (courtesy of Mark Brzezicki on drums and Tony Butler on bass) and the accompanying guitar lines (besides Stuart, also Bruce Watson). And so the album continues to proof the quality on offer. Looking back the Crossing provided the start of a long career that brought the band across the globe and enjoying moderate success that ended with Adamson´s sudden death in a lonely hotel room. But that is a crossing of a whole other level. For now enjoy the timeless energy and the melancholy of this classic. Oh, on the 1996 remaster, the cover colour changes to red and 4 tracks were added.